And we’re not talking early acne here. 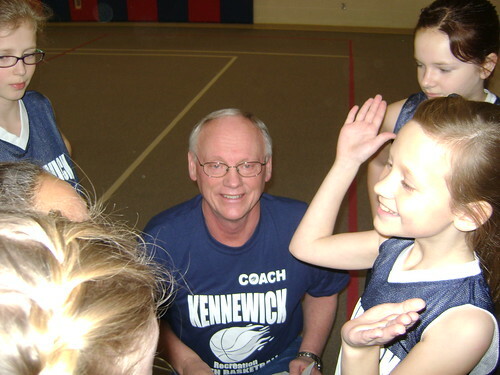 After two fun but fairly uneventful seasons, Megan began her third year of basketball on fire. She broke out during the season opener with five baskets, four of them from fast breaks. Every game thereafter was similar. She was just unstoppable. Meg is smart, quick, confident and always relaxed on the court. I really think she inherited her Uncle Doug’s hooping ability (certainly not mine.) Once again under the direction of Coach Rod, (aka Grandpa), she was christened with the nickname “The Flash” at the end of the season because she is just lightning-quick out there. Who says the short Christensen legs are a liability? The girl’s got skillzzz. As in life, Cindy pretends to be Rod’s assistant while actually telling him what to do the whole time. Getting ready to play or noticing a bug on the ground. Not sure which. Grandpa worries as Meg starts playing Patty-Cake. By the look on Coach’s face, I’m thinking this was the post-defeat obligatory cheer for the other team. The best part is that Megan always has fun. Win or lose, take it or leave it, she doesn’t really care. As long as she gets to hang out with Grandpa and her cousin Bailie, basketball serves its purpose. 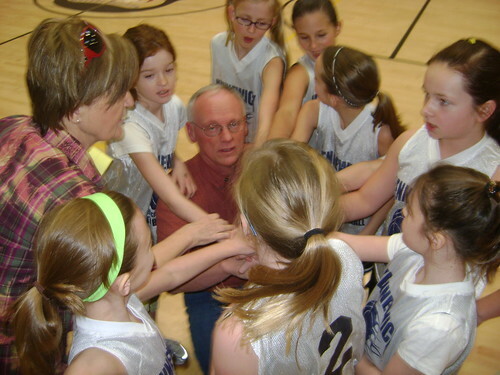 Her team lost only one game during the season, and it was against some very tall, aggressive, slightly scary, slightly dirty players. Even the adults were taken aback, watching from the sidelines. It was a little demoralizing, but on the drive home Megan shrugged her shoulders and said, “That’s the only game we lost all year. Those girls were tough. But, oh well. They’re not a part of my life anymore.” She then smiled and asked if we could go to the mall. Previous Article This time, I’m not exaggerating. Next Article Imagine the splinters. Flashback. I think Rod C. (Steve B.) 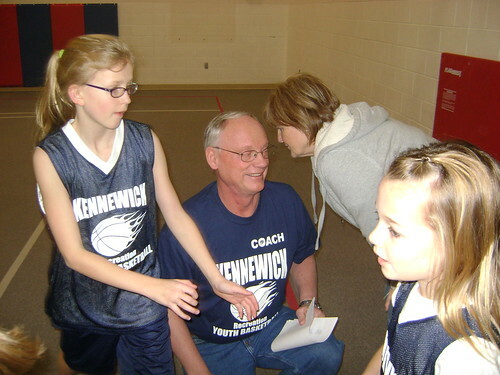 were my basketball coaches when I was about that age, probably a few years younger actually. 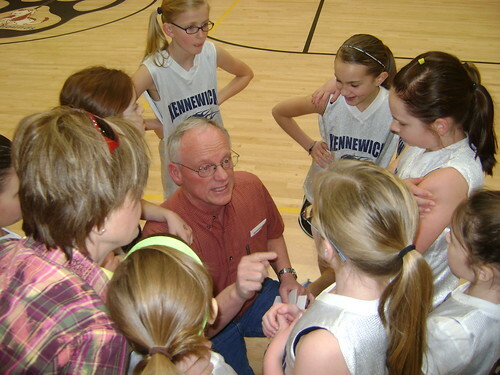 How fun to have grandpa coaching! I love these pictures! 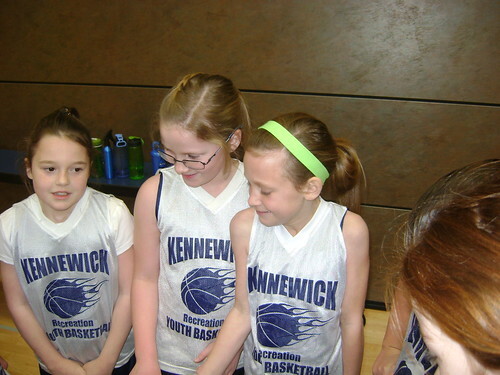 Leave it to Meg to add flair to a basketball uniform with the bright green headband. She is so cute and I’m so happy for her and her breakout season. I hope I get to see a game someday! I’m impressed. And a little jealous. I never did have a “break out” basketball season. Not in 6th grade. Not in 11th grade. Not in 12th grade.